In the Little England of the Cyclades, the 9 Muses are waiting for you in Andros. Next to the cosmopolitan Chora, they offer autonomy and comfort combined with home-like hospitality by their owners. Choose between the 40m2 maisonettes and studios and enjoy all the facilities of a luxury hotel. The rooms and apartments at both locations are equipped with all the comforts and ensure you unforgettable holidays on our beautiful island! Anemomiloi andros partments & studios is a complex of 2 buildings in a fantastic location, with panoramic views, Cycladic architecture, warm hospitality. Welcome to Anemomiloi Andros, in Chora, in the beautiful island of Andros. Paradise Design Apartments are located in the traditional settlement of Batsi, just 15 minutes from the port. The endless blue, the stones and the dew from the green vegetation as well as the crystal springs are the first things you will see and feel welcoming you to the island of Andros. Irene Studios are located close to the crystal clear beach of Agios Petros on the west side of Andros island. The modern complex is a family unit and includes comfortably furnished rooms – apartments in the middle of a lush garden. Just a few minutes outside from Chora of Andros Island, one and a half kilometers away, in a lush green environment, Studios Dryades consist of independent houses of 40 square meters each, with a private veranda and great views offering tranquility and comfort. Villa Fiamegou is conveniently located in Batsi in Andros Island, 50 meters from the nearest beach. There are tourists looking for places special, aesthetic special, enviable location … for unique vacations. Villa Rena Rooms & Apartments is located in a quiet area, surrounded by fir and pine trees. In the garden there are tables with chairs and barbecue. All rooms and apartments, on both sides of the building, have a balcony or terrace furnished with table and chairs. Villa Sofia hotel is located just 250 meters away from the beautiful beach of St. Peter. Twelve spacious cottages framed by six acre garden with a playground and mini football offered for a pleasant stay in the island of Andros. Choose apartments and studios by the sea and by the most central parts of the city! If you are looking for an accommodation near the sea, for your holidays in Andros, then, Adonis Andros Guesthouse is an ideal choice. This is a picturesque accommodation with equipped apartments and studios in Batsi, Andros. Aegea Blue Cycladic Resort is located above the virgin beach of Zorkos, in a protected natural setting of unique beauty. The unit consists of 24 luxurious and independent villas, built by the best Greek architects, so that it looks like an authentic Cycladic village with squares. It is a 2-minute walk from the beach. Aelia apartments is a fully renovated complex of apartments, offering comfort and luxury overlooking the sea. Moreover, “Aelia ” in Homeric language means energy from the sun. So all rooms are oriented towards the unobstructed view of the sun and the sea. The newly unit Aithra, has comfortable surrounding area promises for great vacations. It offers unparalleled sea views and beautiful morning, enjoyable dives in the crystal clear waters of the beach. Also, magical nights on the terraces of the houses. The welcoming owners will offer you a unique guest experience! Aktio Studios offer hospitality in Andros that is open all year round, providing the visitor the opportunity to choose the place of stay between spacious rooms and apartments. All accommodation are air-conditioned and feature a balcony or terrace with sea views. The Alkyoni Studios offers accommodations with a unique beauty, as well as comfort. It is located in Chora in Andros Island, right on the sandy beach of Neiborio. It has lovely studios equipped with a kitchen. All of the rooms are soundproofed with air-conditioning and they have plenty of light. On the beautiful beach of Chora, Neimporio, and only 50 meters from the sea is Andria Studios. In a quiet and family environment, our rooms, providing all the comforts and can accommodate 2 to 4 people. Andria Suites is in a stylish traditional mansion of 1889 in Andros. Renovated with taste, high aesthetics and the latest technology. It is a complex consisting of three suites, uniquely decorated and fully equipped, providing amenities that can meet high demands. Above the magical bay of Batsi, on the island of Andros, in the Cyclades, we built with great love, a complex of apartments according to the Cycladic architecture, the Anemos Studios. The newly built Augustis Suites Hotel, in the picturesque seaside town of Korthi, on the southeastern side of the island, 15m from the crystal clear beach of Mylos. The room has a breakfast room, bar and parking. There is also an apartment for disabled guests. Modern and functional suites with strong influences from the tradition and the unique architecture of the island are elaborately combined to create the “Belvedere Suites Andros”. Danaides Studios is located in the picturesque village of Batsi in Andros Island and it is just a 3-minute walk from the beach. The unit has a Cycladic-style and offers apartments with a kitchen. Free Wi-Fi is available as well as a furnished balcony or a sun terrace. Within 200 meters you will find the beach. The Cycladic-style Dora Studios 2 is located in Batsi in Andros Island, just a 1-minute walk from the beach and 80m from the restaurants and bars. The accommodation combines gorgeously the traditional Cycladic colors, blue and white, with the stone. Pure island architecture with comfortably furnished rooms. Edem Suites are located in the most idyllic spot in Chora, in the enchanting Andros Island. There’s a fantastic variety of 8 beautiful suites to choose from. Each of them has a different design as well as theme, in order to fit your personality. The area is popular for scuba diving. Handakas Studios is located in Messaria village in Andros Island. It is 30 minutes away from Chora the capital of Andros and its old mansions. The accommodation offers beautiful and simple decorated studios and apartments too with a furnished, paved terrace and serves a continental breakfast. The Hotel Aegean Castle is emerges from the environment and is fully harmonized with it. It is located amphitheatrically, isolated, between olive groves, vineyards and dense forest overlooking the bay of Paleopolis. 200 meters from the largest sandy beach of Andros, Hotel Allegria is built with much care and attention. It is within walking distance of the island’s harbor, yet away from its bustling life, in the seaside settlement of Kato Agios Petros. Blue Bay Village Hotel is designed to give you an unforgettable stay. With respect to the environment and traditional Cycladic architecture, Blue Bay is a B-class hotel with modern amenities. Thanks to its privileged position, it offers stunning sea views. Idroussa is located in the heart of Batsi in Andros Island, just 300 meters from the beach. It has traditional colors and offers you an accommodation with private balconies, air conditioning and free WiFi. Within 50 meters you will find a mini market as well as taverns and bars. Ionia Studios is a highly traditional architectural studios. Its sandy beach Agios Petros is just a 2-minute walk and is awarded with the Blue Flag. It is located in Andros Island in Greece. It offers rooms with free Wi-Fi and also LCD satellite TV. Guests have free parking on-site, in the garage. Irene’s Villas is an 11-minute walk from the beach. Set on a green hill, just a few meters from Neimborios Beach, the property offers you exotic furnished studios and apartments with views of the Aegean Sea, as well as a beautiful yard with sun loungers and siting areas. Iro Suites are set in a 5 acre estate, just 1 km from the cosmopolitan Chora, the capital of Andros and the beach of Neimporio. The picturesque studios and suites are amphitheatrically built, with breathtaking views of the mountain and the sea. Kalimera Studios is a 10-minute walk from the beach. 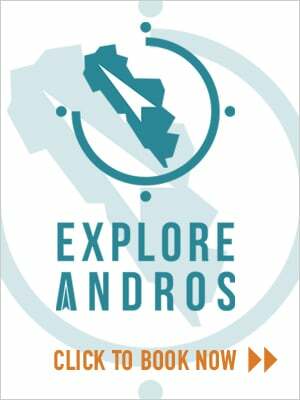 It is located in the majestic Chora, the capital of Andros Island. The accommodation is right on the main road of Chora. The property is surrounded by a well-tended garden and it offers air-conditioned apartments with a balcony or a patio. The Kymothoi Rooms & Pool Bar is a fully renovated unit of 15 room in Gavrio, Andros. The accommodation is built amphitheatrically on the hill above the port and it offers a magnificent view of the Aegean Sea and the busy main port of Andros. Likio Studios is a complex of 2 buildings offering self-catering accommodations with free Wi-Fi, just 150 meters distance from Batsi Beach in Andros Island. Next to the reception there is a TV lounge. The bright and airy studios likewise apartments of the unit have air conditioning, heating, as well as family rooms. Mainades (Maenads) was the female companion of God Dionysus. We’ve stolen five of them, we transformed them into modern warm, two-storey guesthouses for 2-4 persons and we’ve placed them on our area, Menites, so that they can watch the entire Chora of Andros, the villages and the sea. Maistrali Studios are traditional studios that offer hospitality and dreamy holidays in the picturesque Batsi in Andros Island. Seaside studios, just 70 meters from the crystal clear, organized and sandy beach, with the water sports and the entertainment spots. It offers 32 rooms and apartments. The Mastrozannes Rooms – Studios, offer a pleasant stay in an attractive atmosphere. They are centrally located in Batsi, Andros, very close to the beach. Its rooms are especially designed for all your needs. Meltemi offers a traditional-style accommodation with a patio, a garden and a balcony as well overlooking the Aegean Sea. It is just 200 meters from Batsi Beach and a 3-minute walk from the center of the picturesque village. The scenic village of Batsi is full of traditional taverns and café-bars. In Chora, the capital of Andros Island, we have build Myrto Studios for you with love. A small family business, overlooking the main beach of Chora. We offer all the modern comforts for the accommodation of 2 to 4 people and enjoy unforgettable holidays!